All custom fabrication items are made to order and manufactured in house and with over 15 years of fabrication experience, we pride ourselves on the excellent workmanship used on all of our stainless steel and aluminium fabrication jobs. We can fabricate many items used in custom installations and vehicle builds, from engine and gearbox transplants, to engine mounts and brackets, breather tanks, water injection tanks, big winged sumps, the list really is endless. We can manufacture complete custom exhaust systems including down pipes, swirl pots, fuel tanks all customised to suit your car. We produce many custom fuel system products as well as replacing fuel lines and systems. On most cars this involves removing the factory fuel lines and replacing with PTFE lined braided fuel hose. We can supply and fit various roll cages from basic 6 point items to multi point weld in cages. 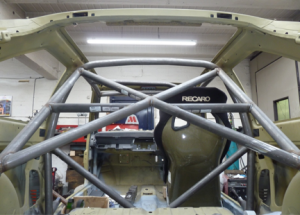 We can also modify and add to existing roll cages to add in additional sections. We offer custom exhaust systems and one-off installations, inlet and exhaust manifolds as well as downpipes all closely designed and manufactured to fit neatly to your car.